I had to go to the dentist last week. One of my upper crowns came loose at night. So I had a bit of a dilemma, do I leave the somewhat snug crown in while sleeping and risk possibly swallowing it? Or do I take it out while sleeping and risk yucky stuff getting in there and possibly damaging the existing base tooth? My second dilemma was the morning before heading off to the dentist. 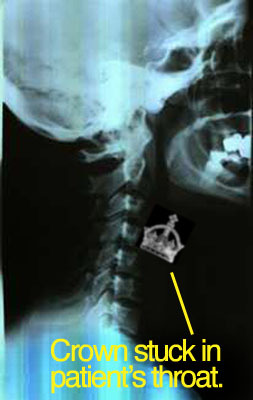 Although the crown was somewhat snug, it could drop down from gravity. I was sleepy, put a handful of pills (multi-vitamin, echinachea with goldenseal, calcium, etc.) in my mouth and sipped a mouthful of water to swallow it all down. All of a sudden the feeling of having all that loose, hard stuff in my mouth made me think that maybe the crown came loose and I’d swallow it along with the vitamins! I had to look in the mirror to assure myself I wasn’t swallowing the crown. Quite nasty business as the thought never left my mind that the crown may be falling down and being swallowed. And of course the capsules and stuff were melting in my mouth during all this. My version of what was going through my mind on the left. I decided to leave the crown in while sleeping which turned out to be the right decision as when I removed it at the dentist the underlying tooth was kind of jagged and they said I could have risked chipping this tooth. Crown is cemented back on and pretty much all is good now. Kids…brush those teeth. Sure you can eat ice cream and cake without teeth but believe me, crunchy tortilla chips taste good too. Next PostNext Nickel & diming their employees?